World Wide Web or WWW was first introduced in the year 1991. But, later, as the technology advanced, new versions of web standards in the form of Web 1.0, Web 2.0 and Web 3.0 came into existence. 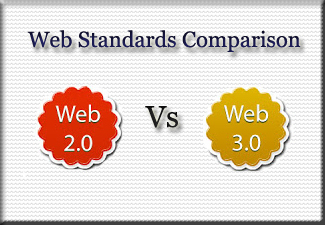 However, Web 2.0 and Web 3.0 are obviously considered more advanced and easy to use when compared with Web 1.0. But, most of the people are confusing with the changes and the evolution that have taken place. This article aims to be clear out the difference between Web 2.0 and Web 3.0. 15 The key technologies developed during this stage of the Web include are Blogs (Blogger); Wikis (Wikipedia); Social Bookmarking (del.icio.us); Social Networks (Facebook, MySpace); Instant Messaging (Yahoo!, Google Talk, AIM); Mash-ups; Auction Web sites (eBay); and Professional Networking (Linked-in, Plaxo). The key technologies developed during this stage of the Web include are Ontologies (YAGO, DBPedia); Semantic Searching; Thesauri and Taxonomies; Personal Intelligent Digital Assistants; and Knowledge Bases.